A bit more than two-thirds of Tunisians feel their country has good relations with the European Union, and most say the EU has a positive influence on development in their country. Forty-eight per cent of Tunisians are aware of the financial support provided by the EU, and half of them say it is effective – just some of the findings of the latest annual opinion poll in Tunisia, published by the EU Neighbours South project. The survey – part of a wave of opinion polls carried out in seven southern Mediterranean partner countries – was conducted in Tunisia from August-September 2017, with 1,000 people consulted in face-to-face interviews. Respondents were asked about their general perceptions of the EU and the values with which it is associated, about EU relations with their country, and the impact of EU financial support. The surveys also look at preferred sources of information, how people feel about their personal situation and the situation in their country, and their expectations for the future. In general, Tunisians were less positive in their perceptions of the EU than the regional average for the three Maghreb countries (Algeria, Morocco, Tunisia), a trend reflecting a slightly less optimistic outlook about the situation in their country, and life in general. Asked to describe relations with the EU, 67% said they were good, compared to an average of 74% in the Maghreb. Fifty-seven per cent of those asked saw the EU as an important partner, while 54% felt the EU had a positive influence on the development of their country (60% Maghreb average). Forty-eight per cent of Tunisians were aware of the financial support provided by the EU, and half of those saw this support as effective (50%, compared to 59% regional average). In more general terms, 50% of those asked had a positive image of the EU, compared to the Maghreb average of 55%, while 17% had a neutral image and just 22% a negative image. As in other countries of the region, the values most frequently associated with the EU were human rights and individual freedom; those least associated with the EU were the absence of corruption, solidarity and tolerance. Tunisians feel EU support has contributed the most to tourism (40%), economic development (21%) and trade (20%) in their country, and are keen for the EU to play a greater role in the areas of economic development and migration. 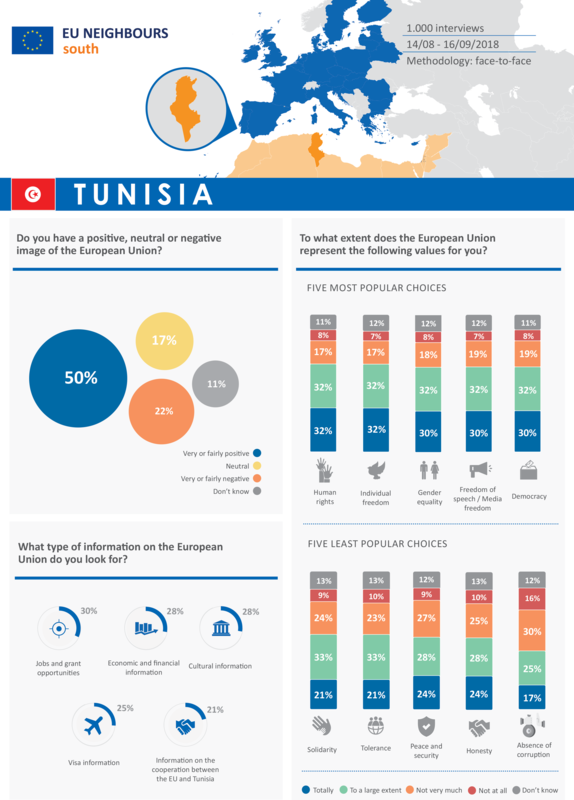 In general, Tunisians think that the European Union’s image in their national media is positive. On television, forty-six per cent of them believe that the image is very to fairly positive, while thirteen per cent believe it to be very to fairly negative. Television is followed by websites (42% positive, 22% neutral, 13% negative) and printed press (35% positive, 27% neutral, 12% negative). Tunisians are generally satisfied with their lives (57%, compared to an average of 72% for the Maghreb), but worried about the economic situation in their country (82% feel it is bad, compared to 64% in the region). But they are hopeful that things will improve over the next 12 months, with 37% expecting their life in general to be better (against 34% who are expecting it to be worse) and 37% expecting an improved financial situation of their household (against 16% who are expecting it to be worse). The EU Neighbours South regional overview report and factsheets are available here. To find out more about EU - Tunisia cooperation and partnership, go here.